This entry was posted in recipes, Uncategorized and tagged cake, chocolate. Bookmark the permalink. That looks kind of incredible and the sauce/glaze is absurdly enticing! Great work! I think my husband and I are going to be spoiled as she learns more recipes. Fine with me! So sweet of your daughter to bake for your birthday. Happy Birthday! I can’t believe this was baked by a 12 year old. Impressive! Will have to check back here for the recipe. Wow! Your daughter is welcome to visit us in Chicago any time. And she can use our cake tins! I’m so impressed! And it’s pretty, too! 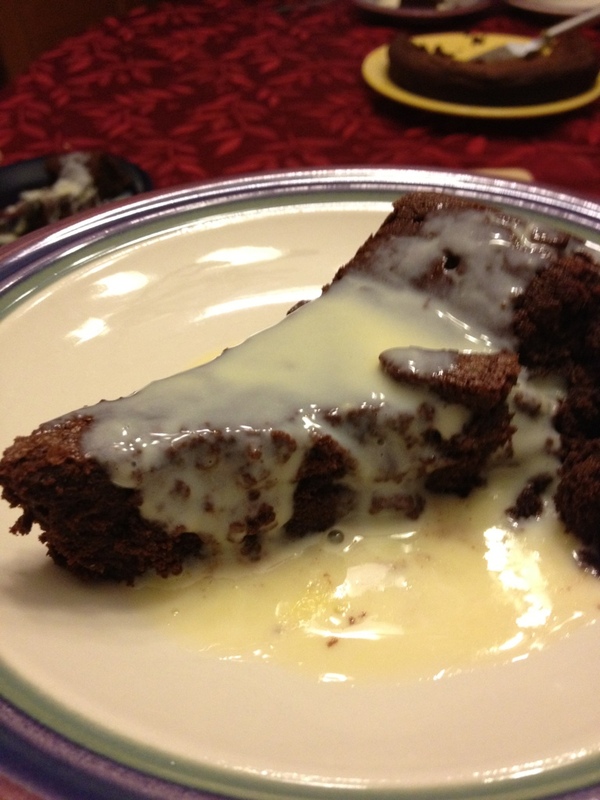 Chocolate cake and creme anglaise – top combination. We’ve been enjoying it very much!